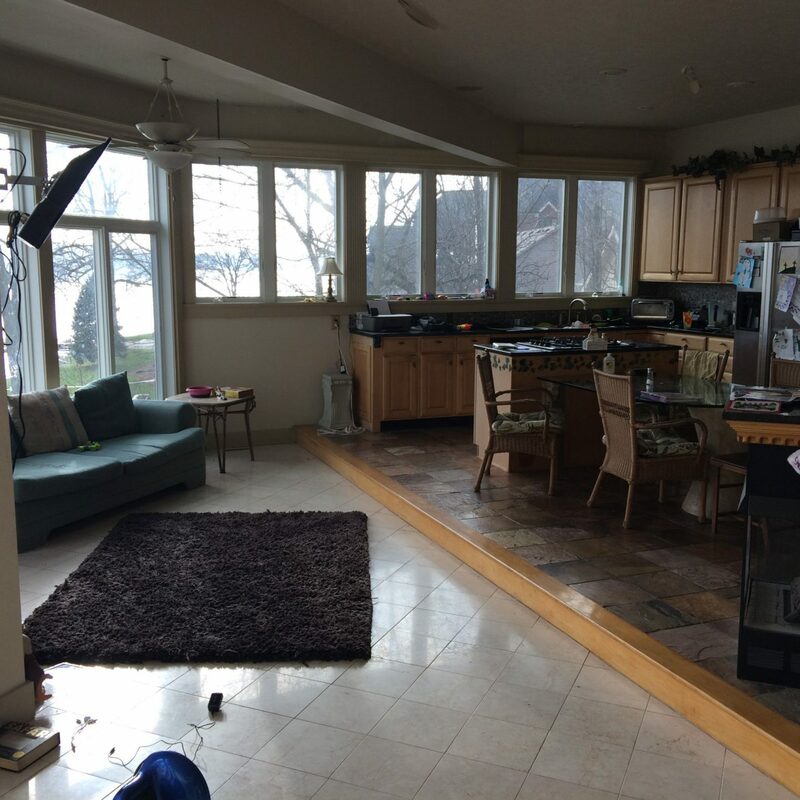 From dated and dingy to bright and beautiful, this 20 year old lakeside kitchen was in desperate need of a major renovation. 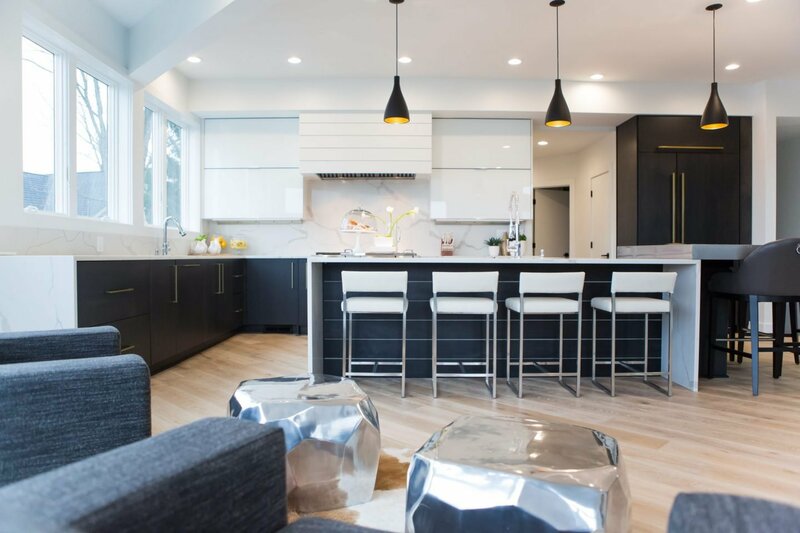 By adjusting the floor height, reconfiguring the layout, and selecting new materials, this kitchen transformed into a classy modern space. 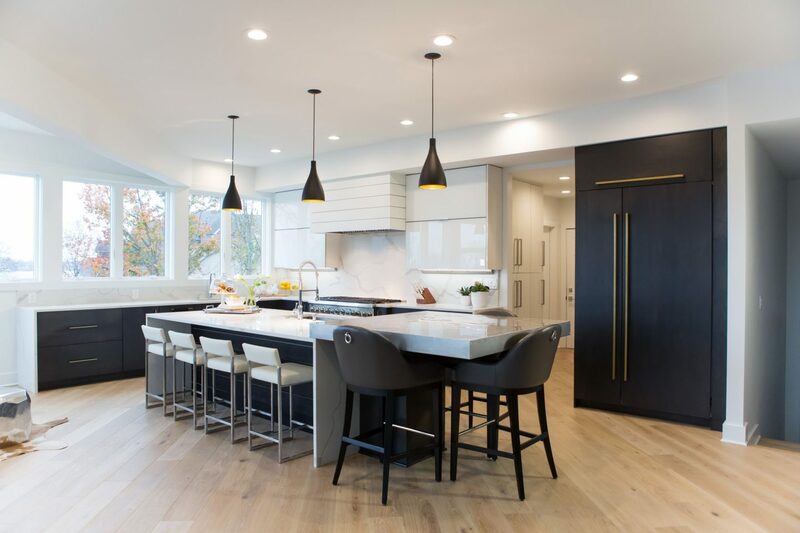 The custom dark-stained frameless cabinetry combined with the painted white glass wall cabinets with a top hinge set the tone of this European-inspired modern kitchen. The emphasis of clean, sleek lines & minimalistic design is apparent throughout every aspect of the room. 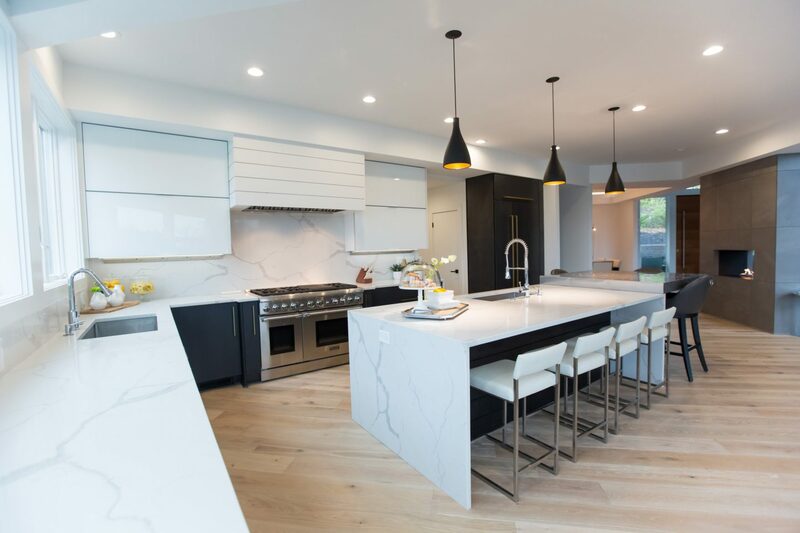 The contrasting light quartz countertops, mimicking the look of a calcatta marble, add dimension and visual interest to the kitchen. The waterfall end panels and backsplash running perpendicular to the countertop help to compliment the linear design. Outlets are hidden under the wall cabinets on the range wall to allow for a seamless eye-catching backsplash. 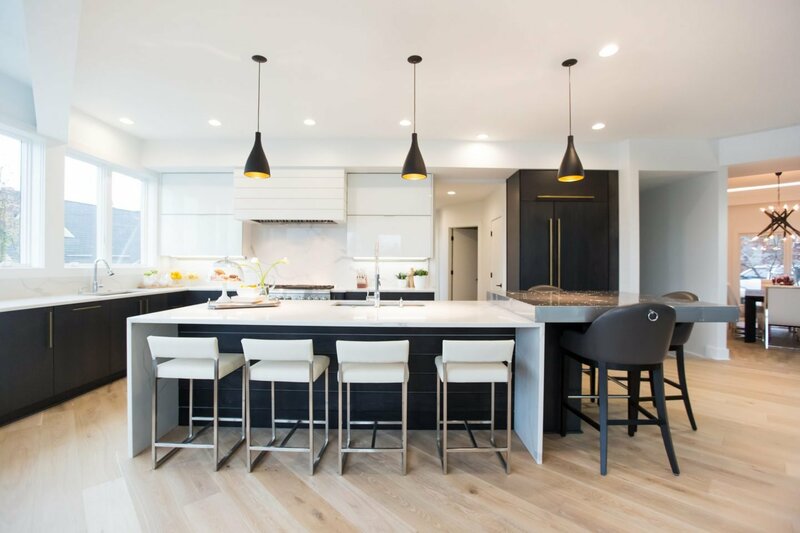 An aircraft metal stainless steel countertop sitting atop a wood base at the end of the island adds texture to the room and defines an area for informal seating. 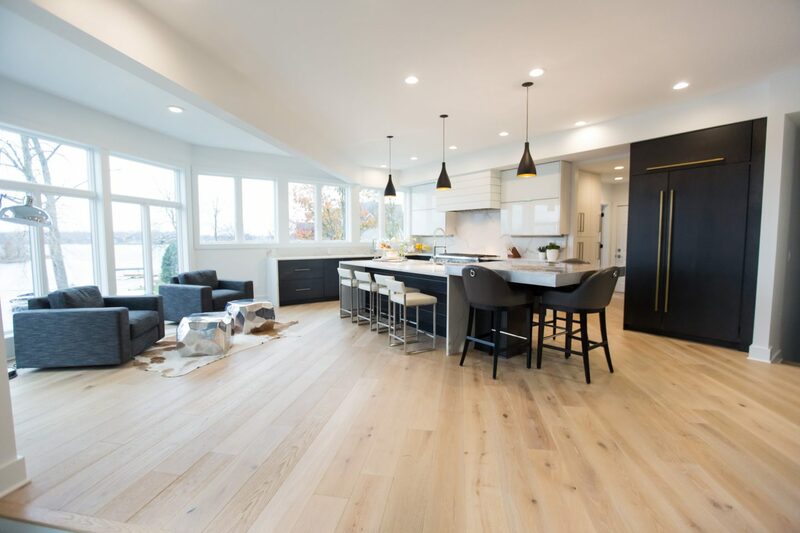 Continuing with the linear design, the 7-1/2” wide, oil finished, neutral-tone hardwood flooring installed on an angle compliments the airiness of the room while still drawing interest to the floor. A 48” Dual-Fuel Thermador Range below a custom designed rectilinear hood creates a striking focal point in the space, while the 48 inches of refrigeration and two dishwashers remain hidden under custom cabinet panels making the space feel cohesive. A Thermador microwave drawer is tucked in the island out of sight, again to keep with the simplicity of the design. 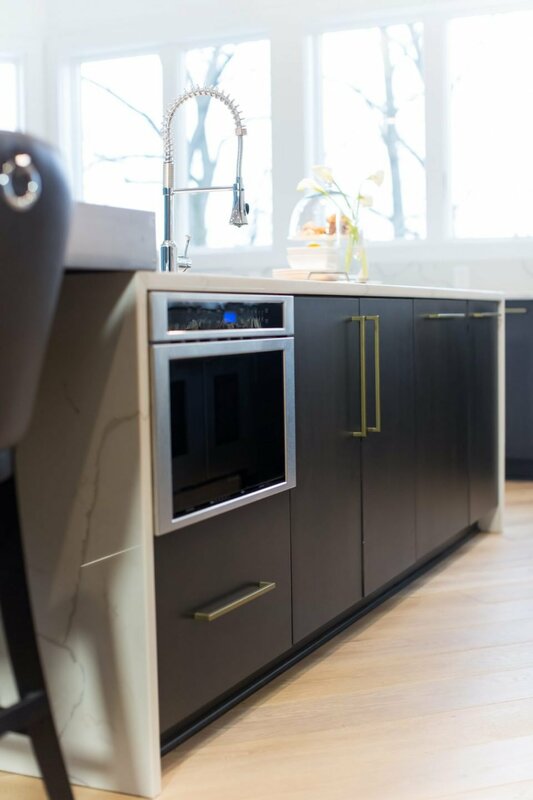 Oversized linear hardware in a brush gold finish adds interest to the flat panel cabinet doors. 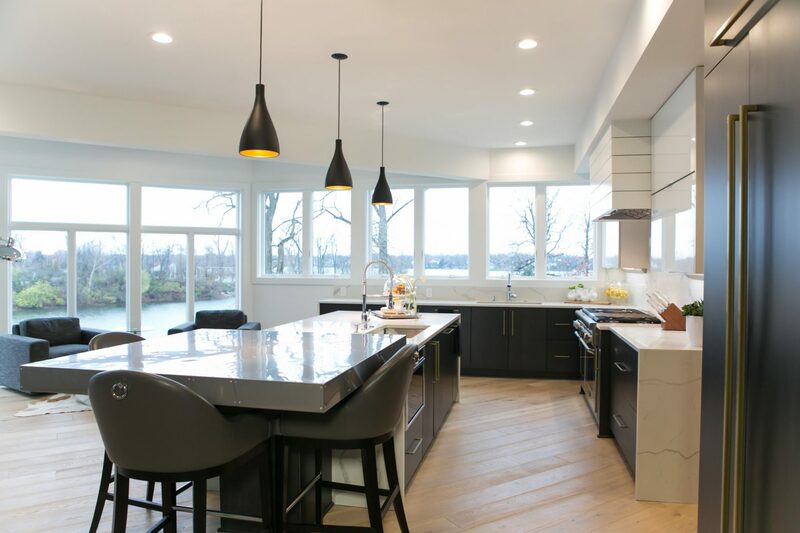 Not only do the teardrop pendant lights in a dark finish draw focus to the island, they help distribute light on the island countertop creating a perfect work-zone. 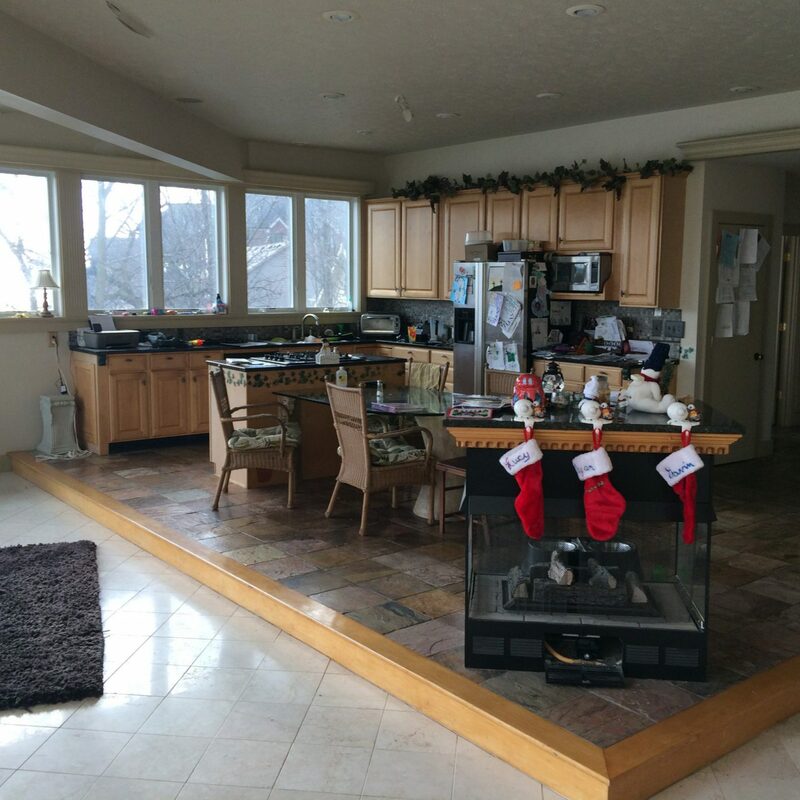 This island work-zone is complete with its own sink and dishwasher making the kitchen very functional. 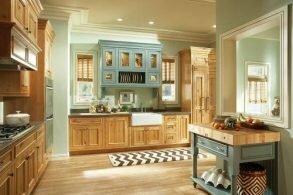 Additionally, the cabinets have been designed with all sorts of accessories to keep the kitchen organized – a double waste basket pull-out, a mixer lift-up, and even cutlery dividers in several drawers have been installed in the cabinetry. Everything has a home. This kitchen is simple, functional, & perfect for entertaining. 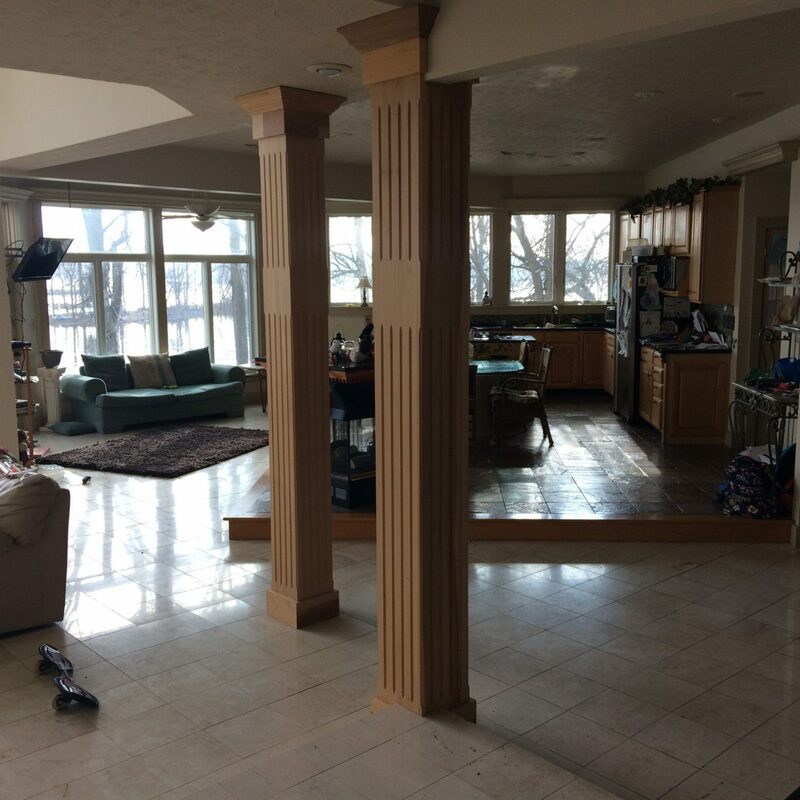 It’s a chef’s dream space and a homeowner’s oasis. It’s airy and inviting, yet sophisticated and clean. Inside and out, and from top to bottom this kitchen perfectly defines modern design.